If gold medals were awarded on the basis of personality, there’s a strong chance Mutaz Essa Barshim would already be the world and Olympic champion. Just three years after scraping high jump bronze at London 2012, his energy, enthusiasm and tenacity means his appearance at any major track meet merits an audience all by itself. With the help of a number of extraordinary rivals, Barshim has brought the event back into the limelight in the last 18 months with many brilliant performances. Sitting down with the 23-year-old in the stands of the Irish national indoor stadium in Athlone the day before he would clear a world-leading height of 2.41m, I was delighted to see that even with the new-found fame he remains well and truly grounded. So as we discuss his journey from watching his dad win race-walking medals to seeing himself on the cusp of being a world record-holder, both indoors and out, there is no sign of arrogance. Since teaming up with his brilliant coach, Pole Stanislaw “Stanley” Szczyrba – former coach to Sweden’s 2007 European indoor silver medallist Linus Thornblad – in 2009, the pair have had some remarkable results to take the jumper from barely making it over two metres to sitting just 3cm off the world record. Despite the occasional struggle caused by things being lost in translation, the pair share a unique ‘language’ and relationship. Although some performances have stagnated within athletics since the highs of the London Olympics, one event that has accelerated sharply is the high jump, where in two years the number of athletes jumping over 2.40 metres has risen by a staggering 500%. During that fight for bronze in London three years ago, which was decided on count-back after six athletes cleared 2.29m, few could have imagined the heights which are being attempted today. In fact it appeared as though the event was in a state of stagnation as, for the 12th successive season, no jumper had cleared 2.40m. Then in 2013 two athletes, Barshim and Bohdan Bondarenko of Ukraine, achieved this. Then in 2014 it became five, on 12 separate occasions. It was Barshim who was the trend-setter when in Eugene he cleared 2.40m and raised the roof of Hayward Field as he became the first athlete for nearly 13 years to jump above that height. Since then the Qatari athlete, has gone three centimetres further and cleared the height on six occasions. As for his 2.29m from London, that would have made him only eighth at the world championships in 2013 and seen him ranked 21st in the world last year. Nonetheless his achievements on that day in 2012, when three men took home a share of the bronze medal, seemingly had an inspirational effect. 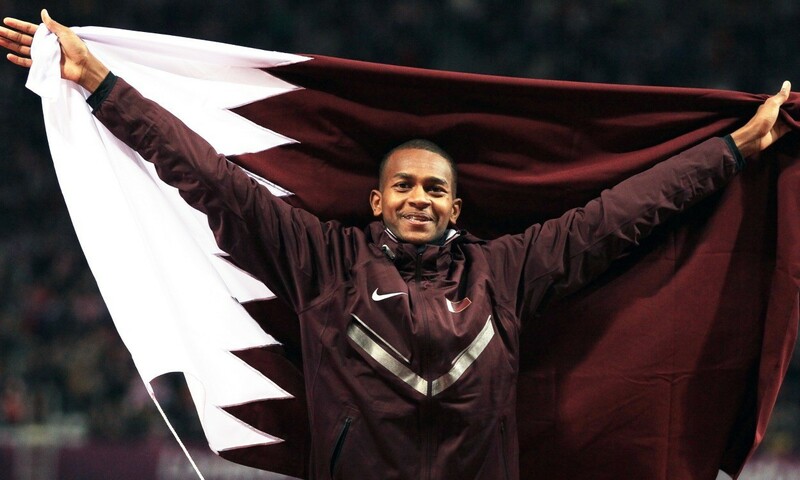 Aged 21 years and suffering the effects from having a stress fracture in his back, Barshim still held his own to become an Olympic medallist just a year after turning pro. Since then it’s not just Barshim’s barriers that have been increasing but his medal collection, after starting in arguably the greatest world championship final to date where he won silver behind Bondarenko, he became world indoor champion in Sopot last March. What is more the jumper has continued to set the bar higher and higher to dominate Asian athletics and he now owns six Asian titles not to mention the continent’s indoor and outdoor records. All of this makes him the perfect role model to inspire greater involvement within the Middle East, something he is well on his way to doing after successfully helping Qatar in their bid to host the 2019 world athletics championships in Doha. Inspired by his father Essa Mohammed Barshim, who was a Gulf state champion and Arab Championship silver medallist race walker, Barshim also began as a race walker, not that he enjoyed that much, becoming a distance runner soon after, a move perhaps caused by boredom? “Yeah I think so,” he smiles, “because back then it wasn’t fun for me as a child and I was like ‘no that’s not the thing for me’.” But even running wasn’t exhilarating enough and so after two years of committing himself to the track Barshim went in search of greater thrills. Now Barshim sits at No.2 on the world all-time list, after an amazing 2014 was crowned by an incredible performance at the Brussels Diamond League last September when he cleared a magical 2.43m to move away from his big rival Bondarenko both on the night and in history. On that evening, the jumper also came agonisingly close in three unsuccessful attempts to break Javier Sotomayor’s world record, while his clearance in Athlone, was so comfortable it could easily have been above the record itself. Yet despite the achievement sitting tantalisingly close, Barshim says his focus for 2015 will be on the world championships and making the podium once more.